To pass emissions in most areas, your ECU has to report almost all of the readiness or monitor registers to read as complete. If you ever have trouble codes, reset the computer, unplug the battery, or even sometimes just give a jump start to someone else these registers might get cleared out. Some of these readiness tests will run over the course of a week or two given the stereotypical american commute. If you were to fail an emissions test simply because of your readiness tests were not done, you might get a printout saying to come back in a week or two after typical driving. However, to get through emissions, you might not have 2 weeks or you might not have a typical commute. There are ways to attempt to trigger these tests, below I mention how I got through it after having a dead battery 3 days before my deadline. You first need to figure out exactly which readiness flags are the issue, as some driving patterns take a few minutes, and others require your car to cool to ambient temperature. I would suggest having an OBD2 tool with you at all times when you do this test. I used a cheap Bluetooth OBD2 adapter and the Toque android app. (The free version of Torque has all the features mentioned in this write up). The screen I was looking at was similar to the one below, and I was every few minutes looking to see if the test I was working on decided to pass. There are several other scan tools that can read the readiness registers. So you know what tests need to be run. Take a look at this official TSB posted below, it is for all Toyotas from 96 to 2002, our cars will be on pages 6 through 9. Then cross check with the test you need to do. I am a 2001 Solara 1mz-fe with auto transmission, and I am not getting through the Cat or Evap tests, so I can see I need to run through driving pattern 4 and 6. Some of these tests are easy and fast to do, others require some very precise conditions. I found the hardest thing finding a place I could go ~40mph for an extended period of time. But I planned it out and I found a stretch of interstate service road that worked very well. Be sure to keep track of which tests require certain temperatures, RPMs, fuel levels, speed, slow downs and speed ups. Plan it out and understand the timings as best as you can. A note about pending faults: Some faults are considered "two trip" faults, where as some sort of action has to fail twice to trigger a check engine light and a real fault code. So, to keep track of these "half way" faults, there are pending fault codes. If there are pending fault codes, some or all of the readiness tests will not run. You will need to do some action to resolve the pending fault. Sometimes you can do a driving pattern twice in a row and this will work (first driving pattern to clear the code, second time passes the readiness test). 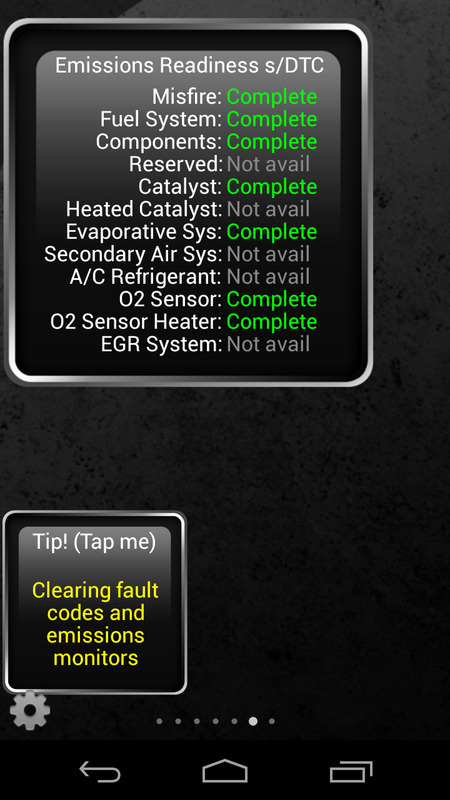 The easy way to clear pending codes is to disconnect the battery or use some OBD2 tool, like torque, and clear them. HOWEVER, either of these clearingactions will also wipe out all previously passed readiness tests. A note about how many items can list as "Incomplete": For cars 2000 and prior, you can have 2 items as Incomplete. For cars 2001 and newer, you can only have one item as incomplete. At least in Georgia, my 2001 Solara failed with having 2 incomplete, and passed with one incomplete. Wow, awesome information. I'm sure someone will find this to be useful. 0) Get an OBD2 scan tool, be it the cheap bluetooth thing or a cheap handheld, you cannot figure this out with blind luck when the EVAP test is designed to run less than once a day. You have to know pending codes, check engine light flags, engine temp, etc. Whenever you get a CEL related to this, take a note and then clear it. But if you get a pending error code, that means the test did run once, and failed ... keep that code there so that if the test runs again you will know (pass = flag cleared, fail = CEL). Be sure other sensors like intake air temp and engine coolant temp are reporting correctly, as those are needed for the EVAP test to run. 1) Gas cap. 3/4ths the time it is an issue with the gas cap. Take a look at the seal. Make sure it clicks a few times after filling it up. Don't be afraid to just go ahead and buy a new gas cap, because most emissions places will test the cap also. You know the cap is working if you hear a vacuum release "hiss" after you have driven a bit, stopped for a while, and come back to the car. No hiss means bad cap, or bad leak else where. 2) Don't top off, and actually don't fill the tank up. Try and stay within 1/2 and 3/4 tank persistently when trying to get EVAP working. Too full or too empty and the fumes don't develop to whatever extent the Toyota engineers think they should be, and you might get a flag even though everything is okay. 3) If you have had any work recently, like a new fuel pump or new fuel tank feeder hose, check around that. 4) Visually check the vacuum lines. The areas containing the tubes of intrest are under the plastic engine cover, behind the air filter / under the brake cylinder, and above the subframe between the two rear wheels on the drivers side. Get a flashlight, lightly tug on things to see if they are loose. Look for cracks. Commonly the VSV for CCV hose going into the air cleaner is left unplugged from oil change places .... but that isn't a huge deal. You can reach the charcoal canister in the back by sliding under the car, but it is easier to jack the car up and let the wheels hang (always use jack stands). If you have had any under carriage trama, check the two stainless steel hoses ... but since those go along with the brakes and fuel, you'd probably notice an issue with those two other systems too. 5) Check that the VSV (Vacuum Switching Valves) work. There are 3. The VSV of Canister Closed Valve located near/behind the Air Filter, the VSV for EVAP (sometimes refereed to as the Purge VSV) located on the left side of that mess of vacuum stuff on top of the engine, and the VSV for Pressure Switching Valve (sometimes refereed to as the VSV Bypass) is on the Charcoal Canister and easy to see by just looking behind the back driver's side wheel. You can use a logic probe or a 9V battery to check them for a "click". If you want to check if the wire and harness are okay, you can use a logic probe at the ECM behind the glove box and trigger each (check the ECM wiring diagram for your car). Some people claim the VSV Bypass (the one mounted on the Charcoal Canister) is a part that commonly goes, but that was not the case for me. 6) Pressure test and smoke test. This will require some hoses, a vacuum pump, or a smoke machine, or a cigar. You will need to either trigger some valves and/or clamp off the air drain hose out of the canister (easy to reach from the back). Look up forums and youtube's on how to do some of this. If you determine the vapor pressure sensor is malfunctioning, you have to drop the canister to get to it, so just drop the canister. I was only able to test the pressure in a few lines because I couldn't trigger the valves consistently. 7) When all else fails, just replace the damn canister. You can get new ones for $175 on Amazon. It'll take you about 2 hours to do. Check youtube videos. While the replacement canister comes with some replacement hoses, it doesn't replace all of them back there ... it is possible you will discover a cracked hose or you will break a hose. I'd recommend having spare hoses ready, or another car that can bring you to an auto parts store. 0) Get an OBD 2 reader. You need this for many reasons on an aging car. Check Amazon for the cheap Bluetooth ones to work with an android app, or a handheld unit. 6) Preasure meters and tests cost money, a cigar does work at about half the accuracy. 7) After the gas cap replacement fails, you probably just want to jump to replacing the canister. You'll need metric socket bits, an extender, and needle nose pliers for het hose clips.